I thought I would pass along some tips for those of you who will be building a house here in Honduras or elsewhere in the tropics. Some of the tips are from our architect, some we thought of when we were designing our home, and a few we wish we had thought of. These are some basic tips to keep your home cool and dry − the major considerations in a tropical area. Although most of the tips are just common sense, those of us coming from colder, drier climates might not always realize their importance. Plan your house to take full advantage of the prevailing breeze. Designing the house so that your bedrooms receive the breeze is a good idea and may save you from using air conditioning many nights. Plan your design it so that you have good cross ventilation. A more open floor plan allows the air to circulate better throughout the house than closed off rooms. Heat rises, so high ceilings can make a big difference. Here in Honduras, it doesn't cost all that much more to make your ceilings 10 feet high because the main difference is adding a few extra rows of blocks. 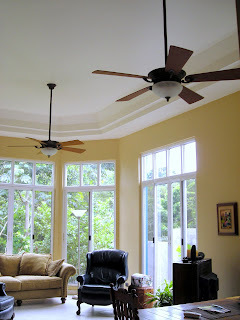 Ceiling fans in most or all of your rooms will help you to feel much cooler, especially in the kitchen. If you have high ceilings, you'll need extensions to drop the fan down so that the blades are at about 8 feet for the best effect. Ceiling fans don't use much more electricity than a light bulb. Good quality ceiling fans are available in the U.S. for around $100 and sometimes much less than that − not that much more than a nice light fixture. Design your windows as tall and wide as you can afford. This helps to let out the hot air as well as to let in the breeze. This will also reduce your need for using lights during the day. Larger windows will add to the expense, especially if you plan to put iron bars over them, but weigh the expense against the extra comfort over time. Plan at least one covered outdoor terraza (facing the direction of the prevailing breeze if possible) and make it bigger than you think you need. 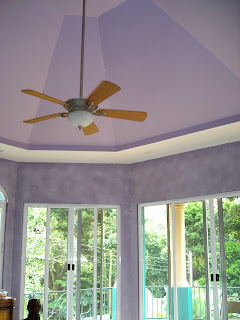 Consider a ceiling fan for your terraza, too. Some days are so hot that you will just want to live outside in the shade. One or two electrical outlets in a protected area of the terraza (terrace) are handy to have for a radio or floor fan. A wide roof overhang helps to block the sun from the windows and help to prevent the rain from entering. To try plan for a few windows that can remain open during rainstorms, such as facing your covered terraza, to keep the house cooler. The weather can be very hot when it rains, too, and having to close all your windows in that heat can be miserable. Leave as much green space around your house as possible. Concrete absorbs the heat of the sun and retains it for a long time. If you have space for trees on the west side of your house, they will serve to keep your house cooler in the late afternoon, the hottest part of the day. 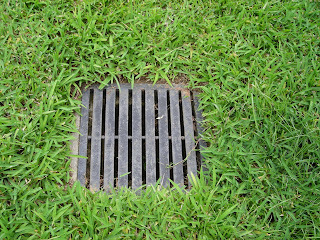 Plan your construction to allow for runoff from tropical storms. It's a good idea to elevate your home one to two feet or even more above ground level. Make sure that your landscaping slopes away from your home, not towards it and ensure that the water has some place to go! The concrete muros (fences) that are so popular can act like a soup bowl during a tropical storm if proper drainage isn't provided. Be considerate of your neighbors and pedestrians − Don't let your roof or garden drain onto the public sidewalks or your neighbor's property! The government of Australia takes energy and water conservation very seriously. Northern Queensland is at about the same latitude as the north coast of Honduras with a similar hot and humid tropical climate. The site mentioned above has numerous links to other energy and water conservation sites. One of the best ones is the Home Consumer Guide. When reading these pages, just keep in mind that Australia is in the southern hemisphere so where you read "north," you need to think "south" if you are north of the equator. Enjoy . . . . and you can thank me later!